Update: At the suggestion of one of the readers at the cross post at WUWT, I’ve rewritten the second paragraph after Figure 3. Thanks, richard verney . In response to the May 19, 2013 op-ed Overheated rhetoric on climate change doesn’t make for good policies by Lamar Smith (Chairman of the House Committee on Science, Space and Technology), the Washington Post published an op-ed by Michael Oppenheimer and Kevin Trenberth on June 6, 2013. The Oppenheimer and Trenberth op-ed was titled Climate science tells us the alarm bells are ringing. Oddly, it is chock full of overheated rhetoric, which Representative Smith was cautioning against. Unfortunately, the Oppenheimer and Trenberth op-ed is typical of the responses by many climate alarmists to Representative Smith’s op-ed, as discussed in Judith Curry’s blog post Rep. Lamar Smith on climate change. In addition, a couple of things caught my eye in the Oppenheimer and Trenberth op-ed. Much has been made of a short-term reduction in the rate of atmospheric warming. But “global” warming requires looking at the entire planet. While the increase in atmospheric temperature has slowed, ocean warming rose dramatically after 2000. Excess heat is being trapped in Earth’s climate system, and observations of the Global Climate Observing System and others are increasingly able to locate it. Simplistic interpretations of cherry-picked data hide the realities. Specifically, Oppenheimer and Trenberth linked Lyman et al (2010) Robust warming of the global upper ocean, and they linked a webpage that introduced Loeb et al (2012) Observed changes in top-of-the-atmosphere radiation and upper-ocean heating consistent within uncertainty. Balmaseda et al (2013) is a newer paper. It was published in May 2013. Kevin Trenberth is a coauthor, yet Oppenheimer and Trenberth chose not to include it as a reference in their op-ed. Curious. Note: After a few preliminary discussions, the uncertainties and difficulties with the Balmaseda et al (2013) paper were presented in detail in the blog post Open Letter to the Royal Meteorological Society Regarding Dr. Trenberth’s Article “Has Global Warming Stalled?”. Refer also to the cross post at WattsUpWithThat. There is also a pdf copy of the post here. The discussions including and following the heading of NORTHERN HEMISPHERE OCEAN HEAT CONTENT DATA DOES NOT SUPPORT BALMASEDA ET AL should also apply to Lyman et al (2010) and Loeb et al (2012). Contrary to Smith’s assertions, there is conclusive evidence that climate change worsened the damage caused by Superstorm Sandy. Sea levels in New York City harbors have risen by more than a foot since the beginning of the 20th century. Had the storm surge not been riding on higher seas, there would have been less flooding and less damage. Warmer air also allows storms such as Sandy to hold more moisture and dump more rainfall, exacerbating flooding. It appears that Oppenheimer and Trenberth presented the 12-inch-plus rise in sea level since 1900 at The Battery simply to make the assumed anthropogenic impacts appear greater. They must have felt the 6.5 inch rise in sea level since 1975 at The Battery (reference here) versus Sandy’s storm surge there of 13.88 feet or 166 inches (reference here) was not significant enough. The sea level rise of 6.5 inches since 1975 is only about 4% of the storm surge so they must’ve believed they needed to exaggerate the supposed influence of manmade global warming. Also, a major portion of sea level rise comes from thermal expansion, but ocean heat content data and satellite-era sea surface temperature data both indicate the oceans warmed naturally. Refer to my illustrated essay “The Manmade Global Warming Challenge” [42MB]. Wisely, Oppenheimer and Trenberth avoided the subject of sea surface temperatures along Sandy’s path. The sea surface temperatures of extratropical portion of Sandy’s storm track have actually cooled since the New England Hurricane of 1938. 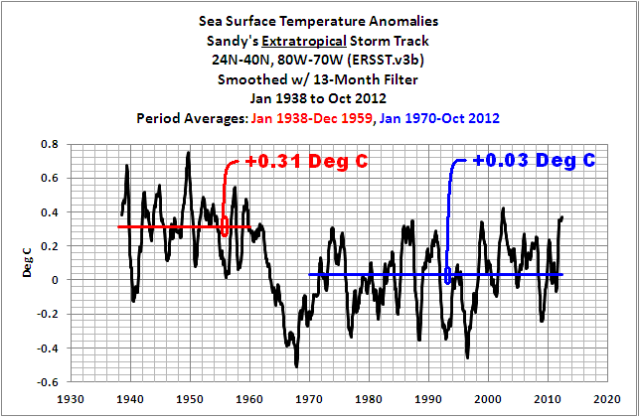 Figure 1 is Figure 4 from the post October 2012 Sea Surface Temperatures and Anomalies Along Sandy’s Path Were NOT Unusual. I published that post within weeks of Sandy. It’s difficult for alarmists to claim manmade greenhouse gases caused the warming of the sea surface temperatures of the extratropical portion of Sandy’s storm track, when the sea surface temperatures there have cooled over the past 70+ years. But Oppenheimer and Trenberth did make a statement with respect to hurricane Sandy that we can check with data. They wrote, “Warmer air also allows storms such as Sandy to hold more moisture and dump more rainfall, exacerbating flooding.” We’ll use RSS lower troposphere temperature anomaly data for Sandy’s storm track. It’s available on a gridded basis through the KNMI Climate Explorer. For those new to lower troposphere temperature data, they represent the temperature at about 3000 meters above sea level, as calculated from satellite measurements. Based on the linear trend, the lower troposphere temperature anomalies for Sandy’s full storm track (12N-40N, 80W-70W) haven’t warmed since 1990. See Figure 2. And for the extratropical portion (24N-40N, 80W-70W), they haven’t warmed since 1985, as shown in Figure 3. Note, the upward spikes in Figures 2 and 3 at January 2013 occurred after Sandy. The sharp drops occurred in November 2012. The October anomalies, leading up to Sandy, were not extraordinary. For Sandy’s full storm track, they were about 0.32 deg C. And for the extratropical portion they were approximately 0.56 deg C. Those values had been exceeded regularly before then. If the lower troposphere temperature anomalies haven’t warmed in 2 to almost 3 decades, it’s difficult to claim “Warmer air also allows storms such as Sandy to hold more moisture and dump more rainfall, exacerbating flooding.” But, obviously, alarmists are more than willing to make claims that aren’t supported by data. Granted, Oppenheimer and Trenberth did not state that manmade greenhouse gases caused the atmosphere to be warmer above Sandy’s storm track, when they wrote, “Warmer air also allows storms such as Sandy to hold more moisture and dump more rainfall, exacerbating flooding.” But they implied it. 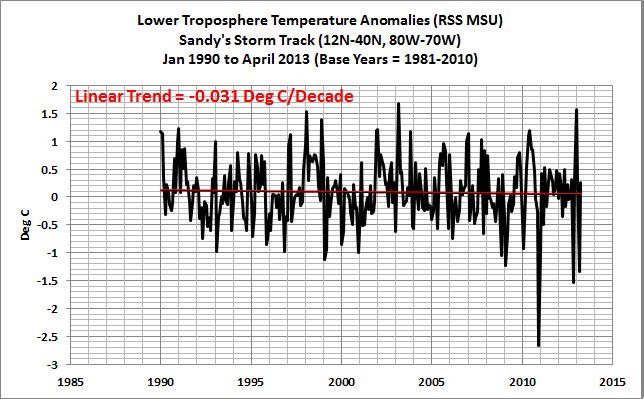 If the lower troposphere temperature anomalies above Sandy’s storm track haven’t warmed in 2 to almost 3 decades, it was pointless for Oppenheimer and Trenberth to write, “Warmer air also allows storms such as Sandy to hold more moisture and dump more rainfall, exacerbating flooding,” unless they wanted their readers to believe the atmosphere above was warmer. Of course, Oppenheimer and Trenberth mentioned moisture in the air, so we need to address that as well. We’ll use the Specific Humidity and Precipitable Water from the NCEP/DOE Reanalysis-2, which are available through the NOAA NOMADS website. And we’ll use the coordinates of the extratropical portion of Sandy’s storm track (24N-40N, 80W-70W). Specific humidity in Figure 4 represents the ratio of water vapor to dry air and is expressed in kilograms of water vapor per kilogram of dry air—at 2 meters above the surface. Based on the linear trend, it hasn’t increased since 1990. The Precipitable Water in Figure 5 is the amount of water in the column of atmosphere if all the water in that column were to be precipitated as rain, and it is presented in kg per square meter. 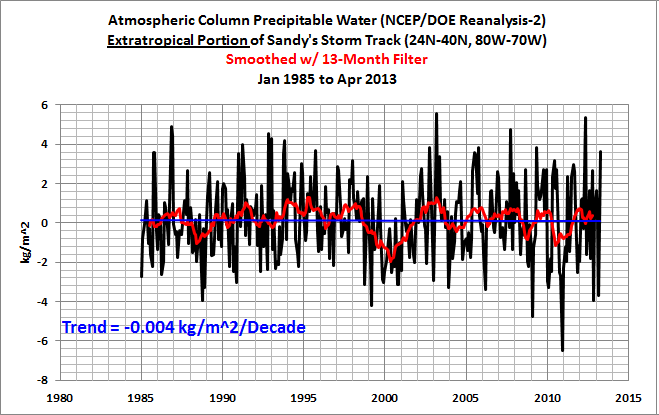 It shows no trend since 1985 for the extratropical portion of Sandy’s storm track. The NCEP/DOE Reanalysis-2 outputs do not agree with the claims made by Oppenheimer and Trenberth. No surprise there. Oppenheimer and Trenberth made claims of “conclusive evidence” about Hurricane Sandy that are not supported by data and by the NCEP/DOE Reanalysis-2. They also complain about cherry-picking but don’t hesitate to cherry-pick a start year when it suits their needs. And I found it odd that they did not cite Balmaseda et al (2013), a paper that Kevin Trenberth coauthored. Please feel free to point out other inconsistencies or curiosities in their op-ed. This entry was posted in CAGW Proponent Arguments, Hurricanes. Bookmark the permalink. As always, you use data to confront the misleading, and often wrong, statements of the so called “climate experts.” I also just read the updated post of Gulf of Mexico SST. So a couple of comments – short, because I am way behind on reading. I haven’t digested enough of these recent papers to get a sense of why O. & T. did not cite Balmaseda. You find that “curious.” So, I’m prompted to try to figure that out – after various chores and a 80 year old’s birthday party. They say sleep is over rated. I went to WaPo and read Lamar Smith’s op-ed. Given their views, I’m surprised the editors printed it. They have several op-eds of their own – links under his. One – “Carbon tax is best option Congress has” – seems to imply all of the problems the US has can be solved with a carbon tax. Well, all except climate change. And that seems to be the key to this whole boondoggle. One of the justifications is to “enhance anti-poverty programs.” Actual climate information and understanding has become a distraction from the issues that are on their minds. Getting back to the Gulf of Mexico. Storm Andrea seems to have formed out of a monsoon trough but otherwise did not have a lot in common with storms of the easterly wave type that progress across the Atlantic from Africa. Joe B. mentions a “a major warm loop current” but neither he nor you say much about this. Origin? Duration? Historical information. How connected to Andrea? Is there a post I’ve missed? Finally: There are currently no tropical systems in the Atlantic according to NOAA/NHC. There is a disturbance just now at the land-ocean edge of Africa (Guinea and Sierra Leone area). John F. Hultquist, sorry. I forgot to ask Joe what he was seeing with the “a major warm loop current” and where he was able to see it. John F. Hultquist: Here’s a description of the Loop Current in the Gulf. I still haven’t found a website that would have shown its contribution to the recent warming in the Gulf. Thanks, Bob. I’ll have a look. A poster on WUWT suggested you turn the above fine essay into a Letter to the Editor (of WaPo). I agree! You might want to ask some of the Ph.D’s of WUWT to sign on, too. More impact. Well, anyway, I spent the last two hours or so editing your excellent work into a letter (fit for general public, I think). Perhaps, you can use this draft to create your own letter. Or, feel free to use it verbatim (after inserting needed source cites as noted). In the future, I would be happy to help you edit or prepare any of your writing. Just ask. Feel free to e mail me. Of course I would do it for free! You have taught me so much, it’s the least I could do. 3) Sea levels in N.Y.C. harbors have risen by more than a foot since the beginning of the 20th century. — While clearly striving to place the blame for Sandy’s intensity on the global warming of the 1980’s and 1990’s (which they have both firmly asserted was caused by human CO2 [Insert cite(s)]), they apparently felt that the 6.5 inch rise in sea level since 1975 at The Battery (reference here) when compared Sandy’s storm-tidal* surge there of 13.88 feet looked pretty puny (only about 4%). Thus, they used an entire century’s rise to exaggerate the supposed influence of human-caused (per authors) global warming of roughly two decades. *[Note: The so called 13.88-foot storm-alone surge cited by many is a flat out lie. Sandy’s surge came at high tide and a full moon which together accounted for 8 feet of that surge. About 3 feet was actual storm surge due to low atmospheric pressure and another 2 feet was due to the wind pushing seas into the narrow funnel at The Battery. 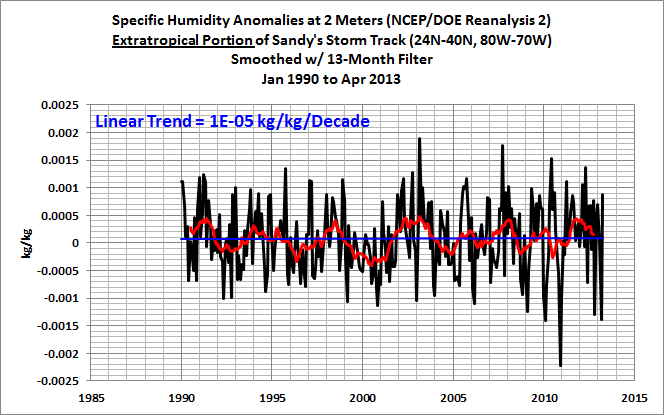 Wisely, Oppenheimer and Trenberth avoided the subject of sea surface temperatures along Sandy’s path. The sea surface temperatures of the extra-tropical (24N-40N, 80W-70W) portion of Sandy’s storm track have actually cooled since the New England Hurricane of 1938. 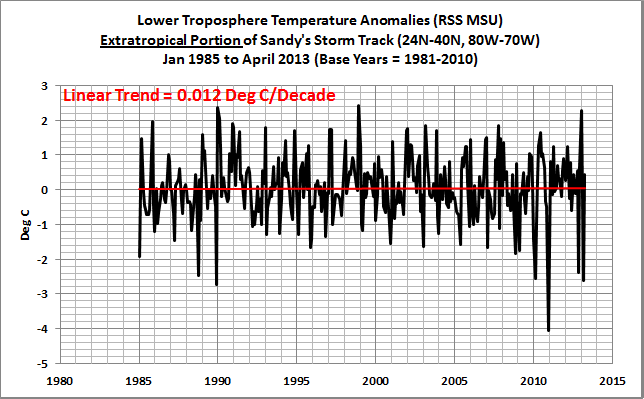 [Insert Figure 1] Climate alarmists cannot claim warming sea surface temperatures influenced Sandy when the sea surface temperatures there have cooled over the past 70+ years. Oppenheimer’s and Trenberth’s grossly exaggerated claims are not supported by data. They complain about “cherry-picking,” but do not hesitate to cherry-pick when it suits their needs. Many thanks, Janice. I’ll give it a shot. And, you are very welcome. Pingback: Mid-August Hurricane Development Region Sea Surface Temperature Anomaly Update | Watts Up With That? Pingback: A Preliminary Look at the Sea Surface Temperature Anomalies Since 1940 along Hurricane Joaquin’s Forecasted Storm Track | Watts Up With That?